New! Tons of Crafting Books for Everyone! We have tons of great new books in right now--too many to count! Here are just a few of what's new on the Fancy Tiger bookshelf. 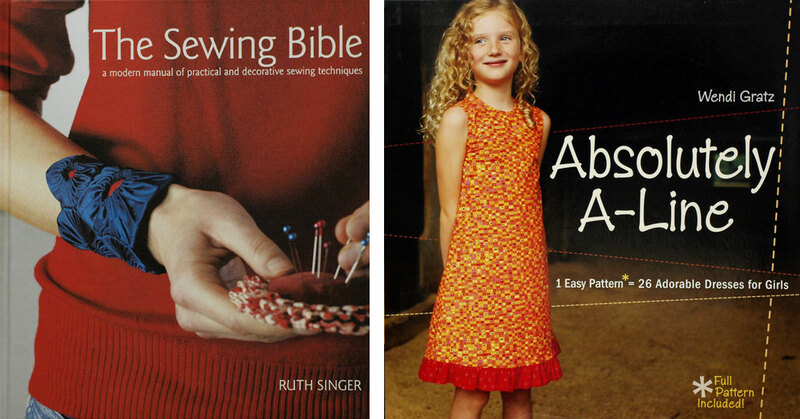 For Sewers The Sewing Bible is the reference book that every sewer, beginner or expert, will be asking Santa for this year. It is amazing, covering everything you need to know about machine sewing, handstitching, finishing techniques and embellishments, plus it includes 20 cute and modern projects. We love the new Absolutely A-Line, with it's many variations on a classic a-line dress for girls. Simple enough for beginner sewers, these dresses can sew up in a flash! 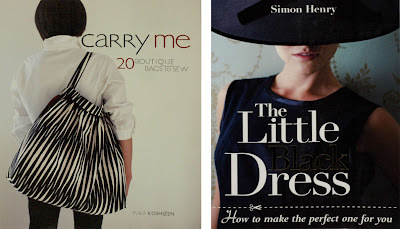 Now, if you want to make your very own grown-up lady dress, this is the perfect book--Little Black Dress by dressmaker extraordinaire Simon Henry will guide you as you tailor-fit the perfect little black (or red or any color you choose, really) dress. 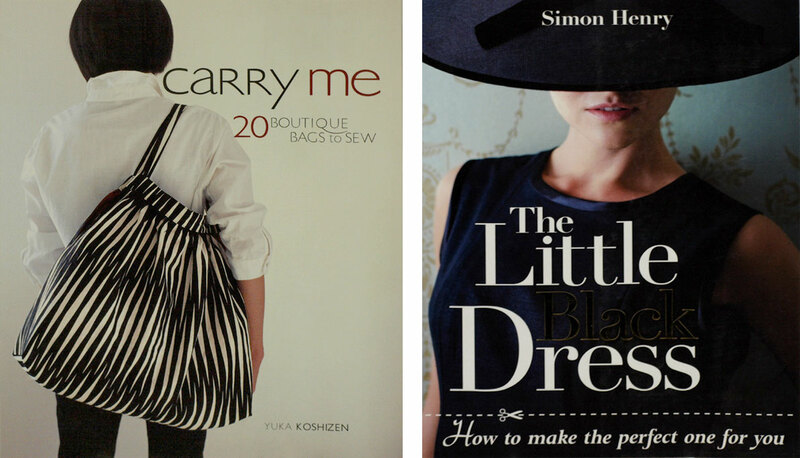 Carry Me is full of tons of sweet bag patterns. We love bags and we kind of want to make them all. And this book is full of good ones. For Knitters The new book Fearless Knitting is the perfect book for moving beyond simple scarves and hats and for building confidence to take on more complicated patterns and projects. For Crocheters Okay, I admit I like math nerds. And craft nerds. A lot. Crocheting Adventures with Hyperbolic Planes is the perfect book for craft nerds who like math nerds, or math nerds who like craft nerds, or even better, craft nerds who are math nerds. Amigurumi Book is full of a-absolutely-dorable crocheted toys. This is the real deal Japanese cuteness. And cute is where crochet really shines. Nadia is a super sweet lady. She sometimes brings us fresh eggs from her backyard hens. Also, she is a preacher. She just took our zippered pouch class and made us all giggle like teenagers when she made this totally awesome "man bag". 1) What inspires you to be crafty? Believe it or not, I'm an ordained Lutheran Pastor at House for All Sinners and Saints. I knit my way through seminary classes, that way if the lecture sucked, heck--at least I got part of a sock knit, so it wasn't a total loss. Fancy Tiger gals are doing their best to teach me to sew. This zippered tote was made in a Fancy Tiger class. I love the beefcake fabric. It's so...festive. I'm still learning to sew. I swear this week I'm gonna try sewing at home without a helper. Pray for me. I love gibbons, the small apes who sing duets every morning with their partners. I came in to work today totally handcrafted from head to knee! 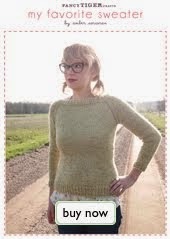 I made my sweater from one of my favorite yarns, Peace Fleece Worsted Tweed, in the color Grass Roots. My a-line skirt is a Japanese print of scary/cute toys. 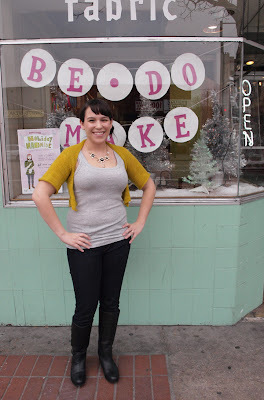 You, too, can sport this über-crafty look with our My Favorite Sweater class and A-line Skirt class! Craftastic Weekend Project: Pony Pillows! We thought we'd share this super simple weekend project--pillowcases! 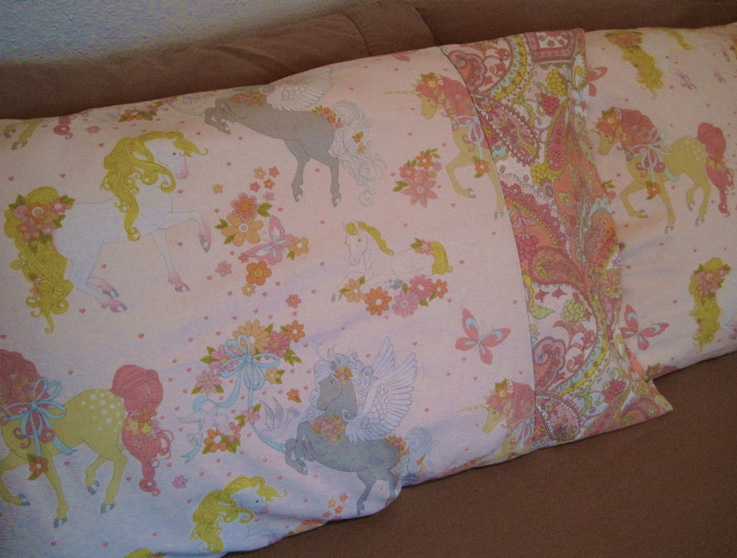 When this over-the-top unicorn/pony/pegasus fabric came in, we thought dreamy pillowcases would be the perfect project. Every 5 year old girl (and perhaps a few grown-up girls) will want these pillowcases in their soft pinks, purples and yellows. For each pillow you will need 5/8 yd each of two coordinating 44" wide fabrics. Cut pieces: Leave fabric folded as you bought it and cut each piece from fold to selvedge so that they measure 20" by 44" (unfolded). Do this for both the main fabric and edge fabric. The edge fabric you will also cut along the fold so you have 2 squares, each 20" x 22". Sew edging onto main pillow: Line one 20" side of edge fabric up with the selvedge of your main fabric right sides together and sew them together using a 1/2" seam allowance. Repeat with the other edge onto the other side of the pillow. Fold and press the opposite edge of the edge fabric in a 1/2" along the edge. Now fold your edge piece over so the folded edge lines up with the wrong side (inside) of the selvedge. Top stitch this on so that the edge piece of your pillow is folded over, thus making the final edge 20" long by 11" wide. Seam pillow sides: Now turn your pillow inside out and line up the raw edges. Stitch these together with a 1/2" seam allowance. Serge or zigzag to finish. Repeat with other side. Enjoy your adorable new pillowcases! Sweet dreams! Angela came to her very first Fancy Tiger Craft Night a few weeks ago and was working on a knitting project in Malabrigo Lace. 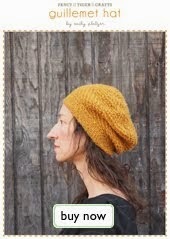 It is so pretty and delicate knitted up in simple stockinette stitch! Angela is using my personal favorite color of Malabrigo, Frank Ochre, a dazzling acidic yellow. She came in a few days ago proudly wearing her newly finished Whisper cardigan. It's absolutely lovely! 1) What makes you want to craft? I moved to Denver with my husband from Boise, Idaho in September. I work in insurance so it's nice to have a knitting as a creative outlet after hours. I knitted my cardigan from Malabrigo Lace using the Whisper cardigan pattern from Interweave Knits. I taught myself how to knit when I was a freshman in college. New! An Abundance of Flannels and Laminated Fabrics!! 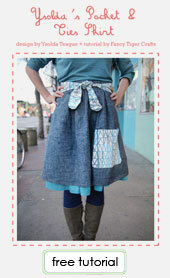 We are ready for cozy winter sewing! New adorable 100% cotton flannels by Amy Butler and Anna Maria Horner have arrived--perfect for cuddly, warm pajamas. If you are new to sewing do not fear, we have you covered with our Pajama Pants class. Also new and exciting are all the laminated fabrics just coming out--super cute winter scenes and delicate florals by Anna Maria Horner and bold, graphic florals and damasks by Amy Butler. 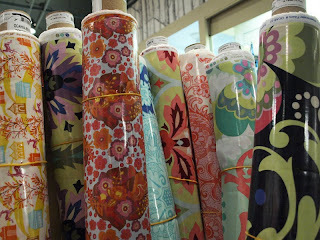 Laminated fabrics are great for totes, aprons and upholstering projects. 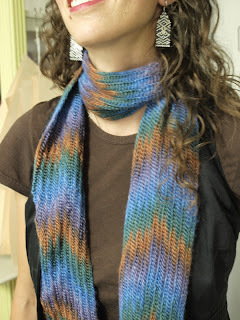 This past summer at the Estes Park Wool Market, I took a class on naalbinding from Erika Thomenius. 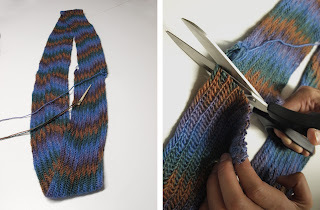 This technique predates knitting and crochet by thousands of years! The only tools you need is a needle and your thumb. 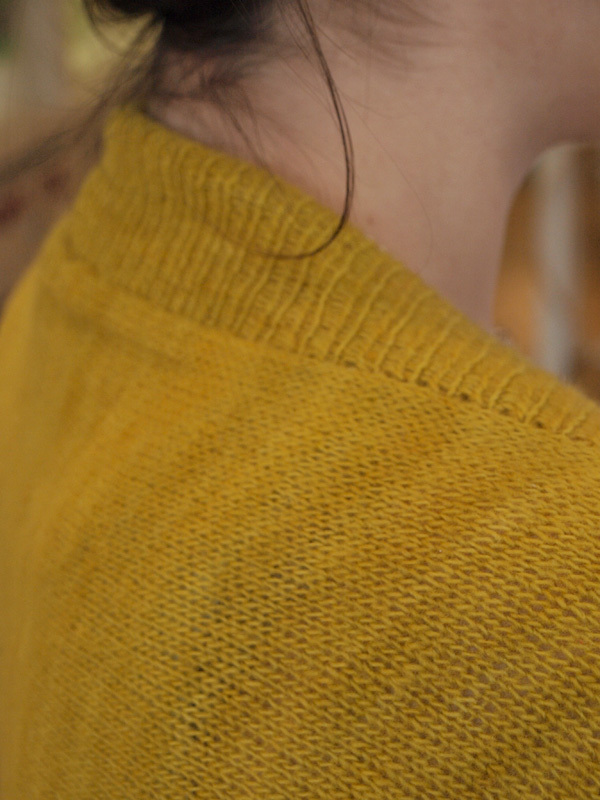 Each stitch in naalbinding is sewn using a short length of yarn pulled all the way through loops on your thumb. 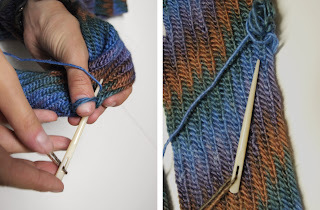 I used a bone naalbinding needle--much like a tapestry needle--for my scarf, which we carry at Fancy Tiger. The scarf was worked in the round in a very large circle, and then CUT into a length because naalbinding work does not unravel! The yarn for the scarf I made is a silk/wool blend single worsted weight yarn. 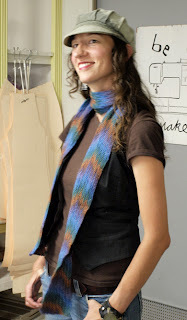 The new Malabrigo Silky Merino yarn would be perfect for this project! New! Malabrigo Twist and Malabrigo Silky Merino! 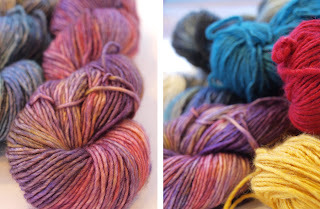 Two new Malabrigo yarns have arrived! Malabrigo Twist is a slightly chunky yarn--soft and luscious merino like our dear friend Malabrigo Worsted, but hard wearing with a high twist and many plies to keep pilling at bay. Great for sweaters! Malabrigo Silky Merino is so soft and so lustrous! 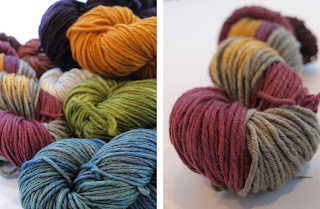 A DK weight yarn that is 50% silk, 50% soft merino, it comes in all our favorite hand-dyed colors. Could it be even softer than the original Malbrigo? 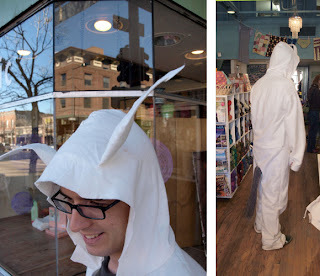 We had a lot of people shopping this past month for Halloween costume crafting supplies. Rick wins our award for best hand-crafted costume. He made up his Max pattern from scratch and hand-stitched the entire thing. Dang. That's pretty amazing. 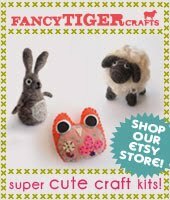 1) Tell us about yourself--what makes you want to be crafty? I am an engineer who just relocated to Denver last month. 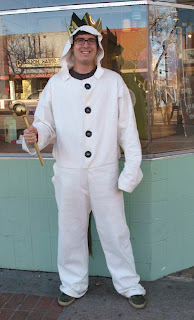 I loved the Where the Wild Things Are book as a kid and wanted to make the costume for Halloween. This is my first major sewing project. 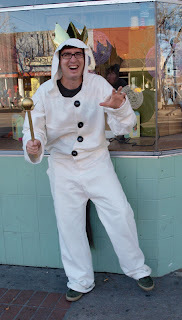 2) Tell us about making your sweet Max costume. It is just hand-sewn using about 5 yards of white bamboo felt. I just measured myself without using any real patterns--although patterns would have made it easier. So just a pencil, ruler, needle and quilting thread. I taught myself for this project and learned as I went. Thanks Rick! Happy crafting and engineering! New! French General Rouenneries Fabrics! 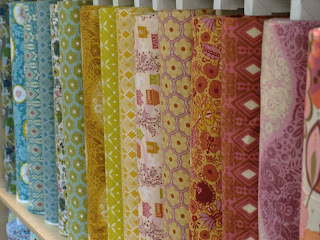 The new French General fabrics are in and they are gorgeous! This line of fabric by Kaari Meng has us inspired with its lovely palette of reds, corals, cremes and ecrus and it's bountiful selection of florals and stripes. We've also received coordinating cotton toweling for darling embroidery projects as well as French General layer cakes and charm packs for patchwork projects.